A Texas man has been alone on Newfoundland's Brunette Island for the last week, shooting a documentary and trying to survive where the buffalo couldn't. A young man from Texas has been alone on Newfoundland's Brunette Island for the last week, shooting a documentary and surviving where the buffalo couldn't. Mack McGowen is not a survivalist. He's merely a typical Texan, who grew up hunting deer and making campfires. Due to unforeseen circumstances, however, he's found himself alone on the desolate island in Fortune Bay without much more than a cellphone. "I felt pretty prepared, and then I showed up to St. John's," he said. "That storm was blowing and I'm watching the sideways rain… I was like, 'Oh my gosh, what have I done?'" The native of Tyler, Texas, was supposed to be a technical consultant for a new concept for a documentary. They were going to live stream a person's experience surviving on a deserted island. As a communications expert, McGowen was tasked with setting up the equipment — and nothing more. Close to the time of shooting, however, the original survivalist backed out. "It was either I go, or all that work was for nothing," McGowen said. "I'm not a survivalist by any means, but I have been in the woods before. So here I'm on a beach with my stomach growling, waiting for the tide to go out so I can get something to eat." 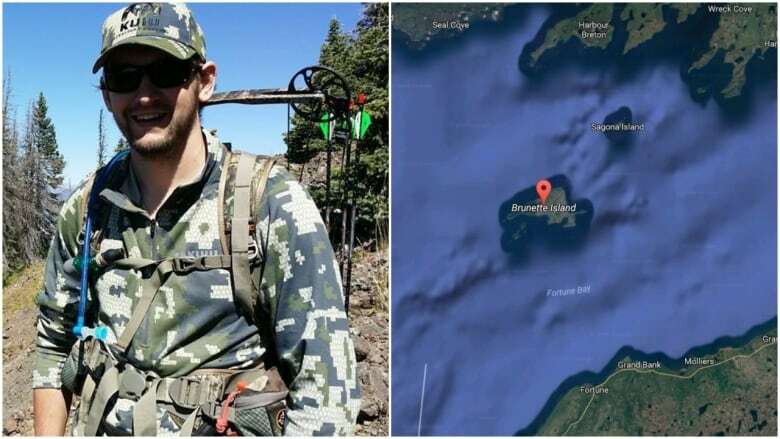 Dave Raven, the project's producer, worked with location scouts to find an island in Eastern Canada with a rugged terrain and total isolation, but that still had access to a cellular network. Brunette Island met all the requirements. The 20-square kilometre island made of rock has been the location for several wildlife experiments since the 1960s. Bison were unsuccessfully introduced to the island, with the last one dying in 1996. However, the island is still home to successful Arctic hare and caribou populations. While he's not allowed to hunt them, McGowen has been impressed by the animals. "They say everything's bigger in Texas, but our jack rabbits are about half that size," he laughed. "I swear, the first one I saw looked like a white-tailed deer or a dog." After arriving in St. John's, McGowen met with Lori McCarthy of Cod Sounds, to learn about foraging. She taught him what to eat, and what can be poisonous. For six days, his diet has consisted of oyster weed, periwinkles and mussels. He spends most of his day moving to new spots on the island while carrying about 68 kg of equipment, and streaming video to followers on Facebook. Waiting at home are his wife and five-month-old daughter. "When it starts getting dark, and that cold weather and the wind starts setting in, that's when you really start to feel alone," he said. "It's your mental attitude, that inner drive that keeps you going... It's faith and family." To view McGowen's journey throughout October, head to www.facebook.com/livecastaway.